Recent events have included mass political mobilization through the internet, and disclosures of US government web surveillance of citizens of all countries. Such things are an example of communication technology going out of the hands of governments and equipping normal people, or at least not staying predominantly as the knowledge of a government and loyal government employees. From such a trend, further triumphs for the democratization of technology can be expected. Key emerging technologies all seem to have strong democratic potential or can surely support hopes for liberty, equality and the empowerment of common people. Although the surveillance technology of PRISM was the monopoly of the US government, I mention disclosures as important to democratization of technology because such disclosures by Edward Snowden were acts of protest against a technology being misused by the state. Exposure of secret government technology and the way it works is a step towards making advanced technologies transparent, known and ultimately at the mercy of popular forces. Governments and massive corporations have always had the ability to conserve powerful technologies for themselves. In the past, certain countries had strong technological monopolies due to the cumbersome and unwieldy nature of decisively important technologies. This caused these technologies to be located within strong political and economic centers of the world. Patents and protectionism have historically been the justifications for the monopolistic technological advantages of certain countries. Now, countries can sustain a high degree of monopoly under the guise of security concerns. However, government and corporate talk of security should be regarded with skepticism. Governments frequently exaggerate or create outright false security concerns to justify their technological advantages, as they did in the wake of Snowden’s disclosures. Talk of security has become a common tool of manipulation, while popular security fears promulgated by the press are often baseless. Much like the assumption that chemical agents are somehow inherently more insidious or terrifying than the problem of conventional weapons, similarly baseless fears abound concerning such emerging technologies as nanotechnology and biotechnology. Greedy entities, whether they are companies or governments, can invoke paranoid security concerns when concerned with a possible democratization of technology or knowledge. Engineers may doubt that various emerging technologies they are working on present existential risks, yet the craftsmen of the monopolistic narrative will insist on security concerns. I would argue that, with the current level of population growth, shortages of resources on the planet, and growing awareness of the inequality between countries, the real existential risk could not possibly arise from the act of unleashing emerging technologies on the world. Information, acknowledged in such expressions as the “Information Age” or “information bomb”, as Paul Virilio describes, is already hard to contain in the present day. The view of knowledge as power rings truer now than at any other period in history. Access to previously restricted government and corporate knowledge and motives helps popular forces in confronting more powerful actors. Further, revolutions in emerging technologies will resemble the revolution in information, in the sense that the emerging technologies will be extremely easy to share. Patents and protectionism would become too difficult at that point, so paranoid security concerns would be the only available narratives to support monopoly. Information is easy to share in the modern day, and this worries governments (especially the United States government) who used to love the sheer lack of information in the public domain. Tear gas, gas masks, surveillance devices and other instruments of repression, which can in fact be used by citizens to protect themselves, are often reserved for government use around the world. This practice will not be sustainable. Just as computer use became a widely available skill, the instruments of repression can become available in a democratic explosion, and common citizens will surely acquire such technologies to improve their liberty. Governments used to actively promote and use ignorance as a means to obtain popular approval of policies, but this is no longer possible in this modern day of information. In response to losing the “soft” battle increasingly, regimes are now entrenching themselves in the domain of hardware as their last line of defense against their populations. As a result, the domain of hardware must become the next battlefield of liberation in the struggle against all repressive regimes wherever they may be, in particular those powers that brag most about their ability to direct their technology against their own citizens and weaker powers. It is in the interest of freedom to widen the government’s hardware disadvantages, cripple government monopolies on technology, and render many kinds of politically important hardware and their features to be universally known and available. It must not be underestimated that emerging technologies could vastly empower weaker nations. One of the most curious features of biotechnology, and potentially nanotechnology in the event that it becomes able to replicate itself, is the ability to offer advanced manufacturing options to people in poor and undeveloped countries. With the introduction of 3D printers and kind of democratic trend such a machine could represent in the future, we can project that emerging technologies are heading towards making compact factories and advanced production facilities. The implication for the world economy is the end of a division of labor that has necessitated people living extremely laborious lives in poverty while others simply sit on the inherited advantages left by past empires. Energy and food are also domains that can be transformed by emerging technologies, to the benefit of poorer countries by potentially allowing the natural development of self-sustainable communities as a result of technologies in the future. For example, consider the diesel that can be made using merely modified microbes and wood chippings. This is the kind of invention that could turn areas devoid of resources into rich production sites for the global fuel supply. When we consider this, the potential of such technology to improve the lot of the greatest number of people in the world becomes undeniable, and this would defy Francis Fukuyama’s bald assertion that biotechnology cannot possibly benefit poorer countries. We are talking about an emerging technology that could be the driving force in a new wave of modernization of parts of the world using nothing but some simple materials and a man-made organism. Yet more organisms could surely be designed to overcome such shortages as petroleum and food, although the idea of vast numbers of such organisms remaining the monopoly of one or a few corporations like Monsanto is unlikely (due to the democratic nature of easily reproduced and user-friendly technology.) The only narrative that a massive corporation or government could exert forcefully to retain exclusive access to a biotechnology is the security narrative, mentioning terrorist threats and threats of disaster, even if such threats are fictive. No-one really has the right to deny a world-transforming technology from reaching the global poor when it can be predicted to help them hugely. Talking about risks of making a new technology widely available should be secondary to talking about the long-term historical risks of not making it available. 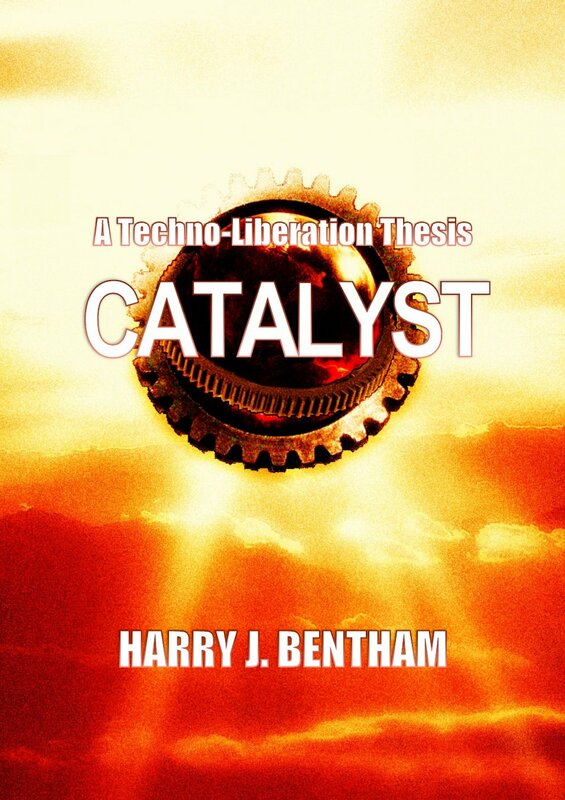 In a recently released book, Catalyst: a Techno-Liberation Thesis, I suggest a novel form of protest that I call “hard-leaks” in reference to the trend of information (“soft”) leaks being increasingly easy via the internet. When faced with a situation where a government or a massively powerful corporation is concealing a synthetic organism or other self-sustaining technology, to the detriment of humanity, one might be morally compelled to “leak” the organism, just the same as if it was a piece of unjustly concealed information. Just like disclosing information to the public to empower us all via awareness, leaking a self-contained and easily reproducible technology for the empowerment of repressed populations and disadvantaged nations is also a moral obligation. It is a moral obligation in much the same way as the act of removing any unjust preponderance of privileges and advantages from governments or massive corporations has been a moral obligation that pushed decisive social change forward in the past. Edward Snowden recognized that awakening people to the government’s abuses was more important than his pay check. Similarly, there will be people involved in biotechnology or other fields of emerging technologies who realize that overcoming scarcity is nobler than extracting maximum profits by keeping scarcity alive until the last moment. Any synthetic organisms that can overcome the major fuel and food shortages in the world will not, and should not, be contained as though they are dangerous. When it comes to things like that, patents and notions of property are irrelevant. Such a technology is the inheritance of mankind simply because it can realize the dream of creating sufficient resources for everyone, and so it should not be conserved for the privileged few. Alert individuals within the relevant industries, who are admirers of Snowden’s rebellion against the government’s monopoly, should recognize their ability to respond to any other unjust monopoly if they recognize it as impoverishing whole nations. In sum, I imagine that the abilities of certain technologies to be self-powered, self-sustaining, compact, or even alive are very significant when it comes to the potential democratization of those technologies. Such abilities indicate the lack of need for a master or proprietor in the equation, just as they indicate the lack of need for a vast division of labor in the world between laborious poverty-stricken areas and high-tech locations or states. Why should anyone care about security arguments, patents and other veiled justifications for monopoly, if they believe such world-transforming technologies can most greatly assist our deprived brethren in the world by having no proprietor? Whatever our political outlooks may be, it is quite likely that technologies of the kind normally reserved for states and powerful firms are going to become increasingly circulated and available to common people. Technologies of the kind normally reserved as the monopolies of especially powerful states or their cohorts should quite rapidly become available to weak states and deprived communities and groups. This is exactly the type of thinking that will end in catastrophe. In a high technology society the individual can destroy the group. What you are advocating is that this ought to be secondary to ephemeral “risk” of not making it available. Your misperception will inevitably be remedied when an engineered virus is released that cause an epic pandemic. This letter to you is like the letter Dr. Albert Einstein wrote United States President Franklin D. Roosevelt on August 2, 1939. This letter is to inform you that it is possible to set up a biological chain reaction with a highly contagious construct virus, and it is conceivable that extremely powerful bombs of a new type may thus be constructed by individuals. Nuclear blindness is the mistaken belief that the bigger the bang, the more powerful the weapon. A highly contagious construct virus is a bomb that keeps exploding through the population at a geometric rate. I estimate it is over ten times easier to construct a highly contagious virus than it is to enrich uranium using the gas centrifuge method. I estimate it is over ten times easier to set up a biological chain reaction with a highly contagious virus than it is to set up a nuclear chain reaction with a sufficient quantity of enriched uranium. I estimate it is over ten times easier for a terrorist to deliver a highly contagious virus than a nuclear bomb. A virus can be easily smuggled because it is small and nonmetallic, and can be used as seed stock to make an unlimited number of bombs. I estimate there are over one million people with the technical knowledge and access to the necessary lab equipment to construct a highly contagious virus. That number is growing. Thanks for your detailed response, Arnold. This is exactly the kind of rebuttal that I expected to receive. I am aware of the risks of biological weapons catastrophes in the future and how the dominant powers in the world portray themselves as guardians of responsibility and ethics while allowing millions to suffer. However, what I am trying to do by making this thesis available is quite simple: I want to make people consider the inequality in the world and how we can reconcile the commitment to equality with the commitment to tell most of the world’s population “you are too dumb and irresponsible to have any advanced tech, or (as it will then inexorably lead to) you are too dumb and irresponsible for us to let you live.” How do we know that denying the benefits of Western technology to the world’s poor isn’t a key source of terrorism and despotism? The West might make itself safer by relinquishing its monopolies and being more humble. Also consider that industrial biotech technicians are not working with pathogens. At no point did I indicate that releasing a pathogen would support development in the world and it would not be people like me who would release a pathogen. Exactly, terrorism is caused by two things; religious extremism and terrible quality of life, leading to a loss of hope in the same way that it leads to crime here in the developed world. Give impoverished people the technology for abundance and you pull the rug out from under terrorist recruiting efforts as well as reduce religiousness in the newly affluent people. Terrorists aren’t the fanatical caricatures our media makes them out to be, but rather people who see no other option in a situation of extreme resource scarcity. What will be the effect on innovation when you put out rules like: I you have something to help us all, we will take it from you at much less than it is worth? Will it not matter in this time line because what could have been will not be known. The socialist or capitalist are happy with what they got as long as they don’t know of other worlds. Pingback: Freedom via Emerging Technologies?